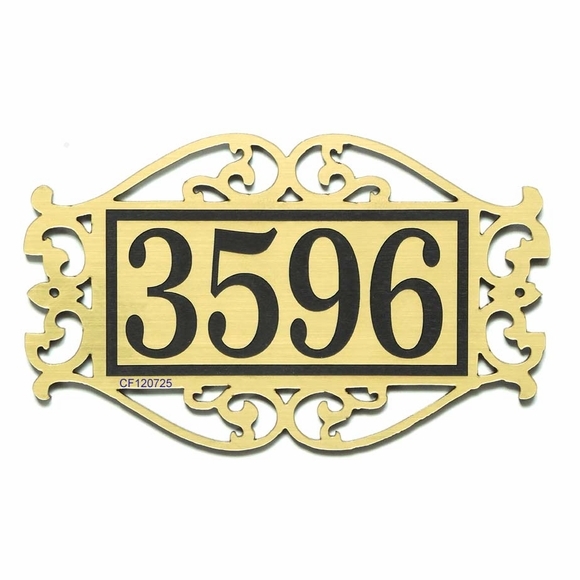 Comfort House Ornate Scroll Design House Number Plaque - - This decorative acrylic address sign in the shown brushed gold and black character design has the look of the typical bronze address plaque. Comes in three sizes from 6" wide to 18" wide. Made in USA. Small size is constructed to fit the rails on a typical entry or inside office or hotel room door. The perfect sign for apartment numbers, hotel room numbers, suite numbers, and more. It holds up to four (4) 1.5" numbers. Dimensions: 6"W x 3.625"H x 1/8". Standard size holds up to four (4) 3" numbers. Dimensions: 12"W x 7.3"H x 1/8". Estate size (also known as large size) holds up to four (4) 4.5" numbers. Dimensions: 18"W x 10.9"H x 1/8". Please note all character counts include spaces and punctuation. Sturdy and UV-stabilized non rusting laminated acrylic construction with permanently engraved characters. Made with 3/16" diameter mounting holes. Each plaque includes stainless steel mounting screws. Note: Small and standard size plaques have two mounting holes. Estate size plaques have four. Comfort House J0018 (also known as CF120725). For an address sign with a wrought iron look, choose black with white characters.